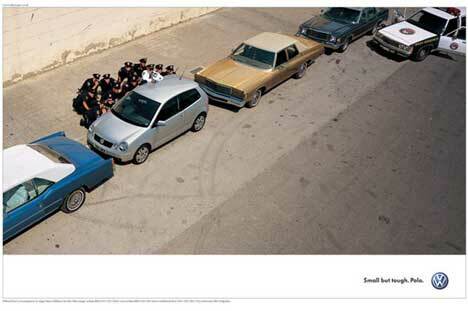 Volkswagen continued its theme of the small but tough Polo in ‘Cops’, an award-winning print advertisement launched in July 2003. Stereotypical American police officers take refuge behind a VW Polo during a gun battle. The Tough for Cops ad was developed at DDB London by creative directors Jeremy Craigen and Ewan Paterson, art directors/copywriters Dylan Harrison and Feargal Ballance, art director Nick Allsop, copywriter Simon Veksner, account planner Hannah Wren, account managers Martyn Farmer and Jason Lusty, photographer Paul Murphy, and typographer Kevin Clarke. The VW Polo Cops ad won the Press Grand Prix at Cannes 2004, Gold Clio Awards in 2004, Gold at The One Show 2004, Gold, Silver and Bronze Advertising Creative Circle Awards in 2004 and gold in Eurobest 2003, Gold and Silver in the 2004 Campaign Press Advertising Award, gold in the 2004 Clio awards, and gold at the Euro Effies, 2004. 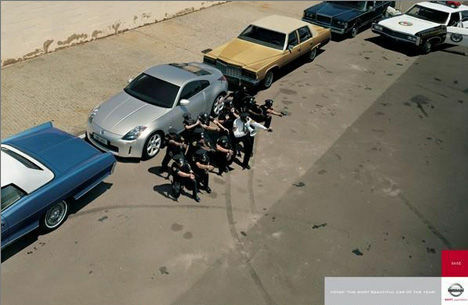 TBWA\PARIS made a reference to the Cops ad in their promotion of the Nissan 350 Z as “la plus belle voiture de l’année” (voted the most beautiful car of the year). Instead of sheltering behind the car, the cops are protecting the car. The Nissan Cops ad was developed at TBWA\Paris by creative director Erik Vervroegen, art director Jessica Gérard-Huet, copywriter Jean-François Bouchet and photographer Richard Dobson.